We are very much privileged to introduce ourselves as “Temptation realty inc”, Professional Real Estate solutions and Services Company with our Corporate Office in Bangalore, the IT Hub of Asia. We have been actively involved with several IT & Retail companies for space advisory, for the past five years working with integrity, commitment and an unwavering effort to maintain the highest ethical standards in the industry. We lay great emphasis on experience, quality of work, and an overall professional approach at all levels. We understand, analyze and implement solutions that fit the client’s strategic, operational and financial goals. Our organization is young but dynamic and quality conscious and follows smart Business Practices. 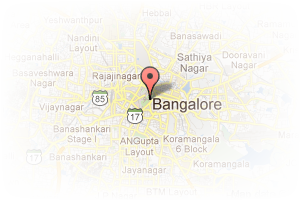 Address: 331, 2nd floor, dorob seth road, Vivek Nagar, Bangalore, Karnataka, India. This Broker Profile page for "Temptation Realty" has been created by PropertyWala.com. 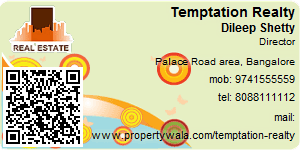 "Temptation Realty" is not endorsed by or affiliated with PropertyWala.com. For questions regarding Broker Profiles on PropertyWala.com please contact us.